Golf: the sport-like activity of high style. 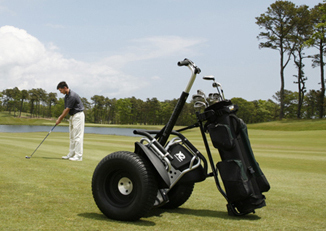 If the goofy pants and awkward hip-shuffling movements aren't enough for you, consider handicapping your game with the new Segway x2 Golf edition. The low-impact turf tires will keep your divot count respectable while speeding up your game and helping you get back to work earlier. Wait a second, who designed this horrible thing? The x2 Golf comes with carriers for your golf bag and score card so you're always prepared. No official pricing on the web, but the original x2 debuted in August at $5,500. That's a minimal fee compared to what you paid for your license to kill gophers from the government of the United Nations.